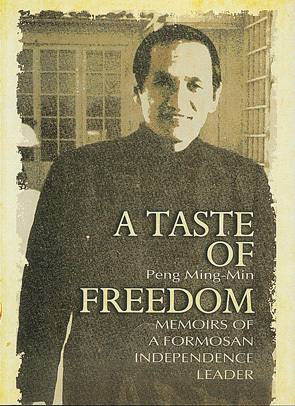 Okay, to explain now: Professor Peng Ming-Min (彭明敏) wrote a very famous book called A Taste of Freedom. It documented Taiwan’s international status as a Japanese colony, post-WWII returned territory to China, and the disastrous circumstances leading up to the 228 Incident and Martial Law (White Terror) period. During this time, Peng had grown up in Taiwan, was educated in Japan, and became a law professor at Tai Da (National Taiwan University). In 1964, was arrested for leading the publication of pro-independence materials. After several years of arrests, torture, harassment out of prison by the KMT government, and threats to his family, Peng was threatened with another arrest. The dramatic twist here is that managed to escape Taiwan– smuggled out in disguise with the help of many people– and safely arrived in Sweden, and then the United States. From America, he wrote his book, candidly and thoughtfully documenting his experiences in Taiwan, and the state of rule by terror and fear going on currently in 1972. Almost needless to say, the book was banned in Taiwan for over 20 years. This photo of Viénet was published by http://www.arenes.fr in 2006. 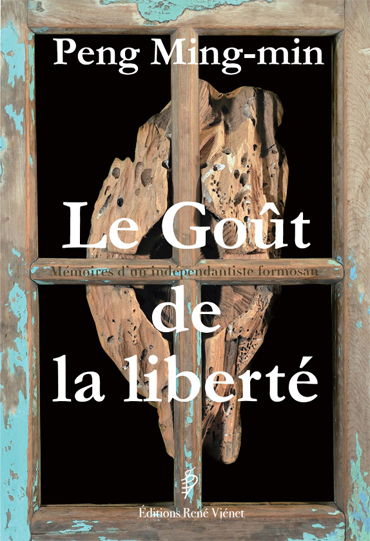 The dramatic cover of the new French translation of "A Taste of Freedom." René has been kind enough to reach out to me this year, since he is publishing a French translation of George Kerr’s Formosa Betrayed, which is the place where I first learned about my grandfather’s political career. He has also published an article by Joshua Liao (廖文奎, Thomas’ older brother, and arguably, the originator of all of Thomas’ philosophical democratic ideas), entitled “Quo vadis Formosa?” (Whither Formosa?) and originally written in French. (None of us have found an English or Mandarin version, mystifyingly enough, so if you have any leads, I’d love to hear them! But then, I suppose it could be a translation project for me when I go back to the US…) So naturally, René has heard of Thomas Liao (廖文毅), and has offered me both help and support in continuing this crazy search to piece together his life, career, and legacy. René has also introduced me to Roger Hsieh (謝聰敏), who was Professor Peng’s student and arrested with him in 1964. As Roger likes to say, he was a few cells down from the other Liaos in prison with him: my father’s cousin Suho (廖史豪), and Suho’s mother. Roger has, in turn, introduced me to many people who have provided help, resources, and important experiences that have added so much richness to my research. Roger Hsieh, on the cover of his recently-published memoir. “Ohhhhh. (!!! )” And just like that, we were all on the same page. Right. (Of course, we had to take a minute to debate the exact year of the first democratic elections!) Sometimes I feel as if I have no business being in the big shot places where I occasionally end up. So yeah, it was an exciting day. Also, in talking about the book to those who may not have ever heard of it or know much about Taiwanese history, I realized that the burden is now on me, to inform and recommend sources on this topic that will both enlighten and entertain (or perhaps if not entertain then engross, due to the brutal subject matter here). 3.張炎憲、胡慧玲、曾秋美訪問記錄，《台灣獨立運動的先聲：台灣共和國》( 上冊 ) ( 下冊 ) ，台北：財團法人吳三連台灣史料基金會，2000. Title translates loosely as: Taiwan Independence Movement’s Precursor: the “Republic of Taiwan.” This is probably THE formative text on Thomas Liao, his group of associates, and the “Republic” they formed in exile in Tokyo, which presented an alternate, democratic form of government than that of the KMT. It’s complicated, obviously. But it’s a very important book, written by several authors using oral history interviews– but primarily by a very important history scholar, Prof. Zhang Yan-Xian. I am reading parts of it in Chinese and getting parts translated. My understanding of it is going slowly, but it’s a great book for any native (or just tremendously expert) Chinese speakers/readers! Shackleton was a diplomat from New Zealand, stationed in Taiwan during the 228 Incident, and was not able to publish this book about what really happened during that tumultuous time until much later. This was a letter that Roger smuggled out of prison in the early 1970s (during his second time in prison). He snuck it to a friend who was getting out, and that friend sent it to the New York Times, where it was published, exposing tactics of prison torture used on suspected dissidents in the 1960s and 70s. It also catapulted Roger into an international spotlight, and when he left Taiwan in political exile in the late 1970s, his career was solidified as a spokesperson exposing and denouncing human rights exploitations worldwide. If he’s willing, perhaps I’ll put the full text of this letter in a future post, but you can also find it in the New York Times archives (April 24, 1972, “From a Taiwan Prison”). That’s so cool, Kim! You’re such a rock star! you’re amazing. jia you ! Way to go–schmoozin’ with the big shots! What an exciting development. Can’t wait until your book is on that list.